PolyScience The Smoking Gun Portable Food Smoker adds big, smoky flavor and aroma to foods and beverages in just 5 minutes. It's smaller and more versatile than using a smoker grill, the portable smoker alternative to traditional smoker accessories for cold smoking meat, classic cocktails and making other smoking recipes quickly and easily. No presoaking wood chips before smoking foods, or cooking foods for hours to achieve smoky flavor. Cold smoking with The Smoking Gun gently infuses a measured amount of natural, cool smoke to prepared foods, even delicate foods, to enhance flavors. It does not cook or preserve foods, or change their textures or temperatures. Smoke salmon after plating or serve smoked trout in a flash. Smoke meat and poultry easily during food preparation. Elevate bartender recipes for exciting smoked drinks and smoky cocktails, like Smoky Marini, Smoky Mary and Dragon's Breath. The smoke gun works indoors and outside, with a variety of wood smoking chips, teas and spices, even hay, dried flowers and herbs. Be creative and pair combustibles with foods. Infuse cheese with a smoky dill flavor, or butters with rosemary or thyme, smoke cherry tomatoes and shallots for salads, smoke sauces, chocolate, meringues and fruits. To use, simply fill The Smoking Gun chamber with desired combustibles, turn it on, light combustibles with a match or lighter. The 18-inch flexible extender hose makes it easy to apply the smoke directly where it's wanted, even inside reseal able bags and containers. The anodized aluminum smoking chamber contains the heat so only cool smoke is produced. 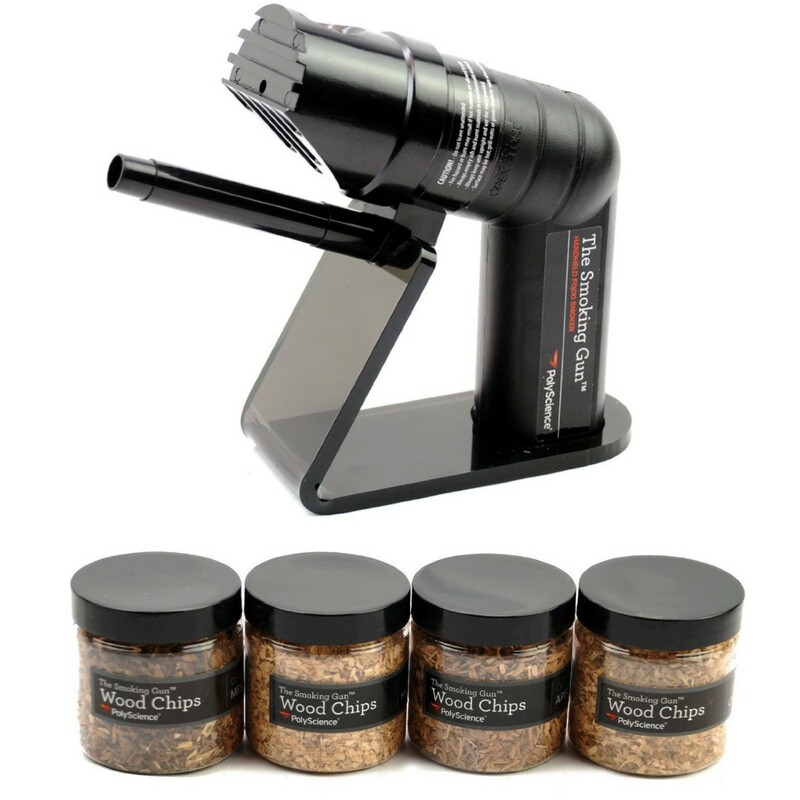 The kit includes The Smoking Gun, acrylic stand, 18-inch nozzle-extender hose, 4 AA batteries, 2 1/2-ounce samples of Apple wood chips and Hickory wood chips. Portable and battery operated to take and use anywhere. Lightweight for effortless, one-handed operation. Store upright on the acrylic stand when not in use. Complete operating and care instructions included. 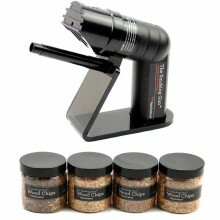 Click the button below to add the PolyScience The Smoking Gun Handheld Food Smoker with Wood Chips to your wish list.